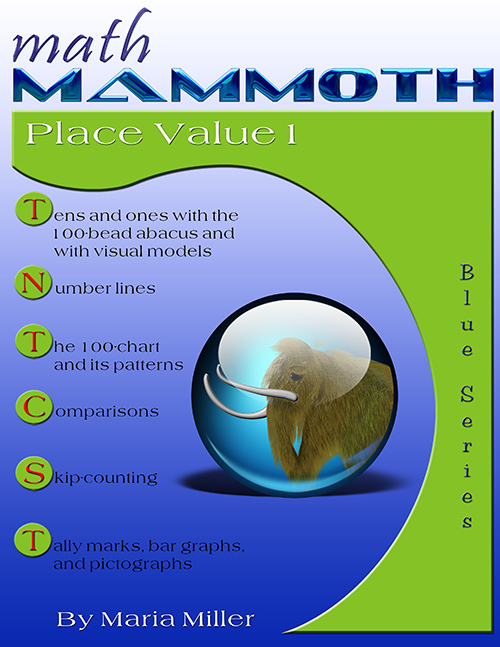 Math Mammoth Place Value 1 teaches students two-digit numbers, or place value with tens and ones. This worktext is suitable for kindergarten (partially) or first grade. The initial lessons that introduce tens and ones use a 100-bead abacus extensively. A 100-bead abacus or school abacus simply contains 10 beads on 10 rods, a total of 100. It is not a special abacus as used by the Chinese or the Russians. In the school abacus, each bead simply represents one. The 100-bead abacus lets children both "see" the numbers and use their touch while making them. At Amazon you can find Melissa & Doug Classic Wooden Abacus at Amazon for around $10. An abacus where the beads alternate colors by fives is even more useful. TIP: If you get a regular abacus with 10 beads the same color, paint a thin white line on the right side of bead #5 and also on the left side of bead #6 on each row (counting from the left). This will make it easier to see 5 and 5 on each row. You can browse Amazon's abacus selection here . Other stores carry abaci as well. If you cannot obtain a real abacus, you can probably use this virtual abacus. The abacus is used in the first lessons, but it is not the only model used in the book. We also use a visual model of blocks where ten of them "snap" together to a stick. If you already have so-called base-ten blocks, you can use them along with the visual exercises, if you want to. Then, the book also uses the 100-chart and number lines. Number lines help visualize how the numbers continue indefinitely and also connect with the concept of measuring. The 100-chart helps the child to be familiar with the numbers below 100 and find patterns in the number system. When children count, they basically just learn numbers as some kind of continuum that continues and continues. With simple counting, your child might not catch on to the inherent structure and how it goes into groups of tens and hundreds and thousands. For children to understand place value, they first need to know their numbers up to 10, do simple addition with small numbers, and understand about counting in groups. Our whole number system is based on the idea that if you have lots and lots of objects, the efficient way is to count them in groups of tens, hundreds, and thousands - not individually. The crucial point in understanding the concept of place value is that a certain position represents a certain size group. Then the digit in that position tells you how many that size groups there are. For example, in the number 2,381, we adults already know that 8 represents eight tens, and not just "8". The number 3 represents three hundreds, and not just "3". The placing or positioning of the digit tells us what size groups we mean, and the digit itself tells how many of those groups. 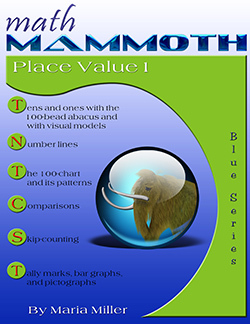 In this book, children learn this idea for just two digits, or two place values. For that matter, we could start a different system of writing numbers where font size tells you the place value: for example 782 would be 7 tens, 8 hundreds, and 2 ones = 872. Please note that this idea is NOT developed in this book. It is just an example to let you see that the place value concept is about something abstract (certain positioning) representing a certain size group. The two lessons in the end, about graphs and money, are included as real-life applications of two-digit numbers. You do not have to study them in this context, though, but could instead study those topics some other time as you see fit. Check also online games for teaching place value, and different kinds of number charts you can create. Free place value worksheets for grade 1 — includes building a two-digit number worksheets (such as 70 + 4 = ____ ), tens and ones missing number problems (such as 5 + ___ = 65), and 100-chart worksheets.